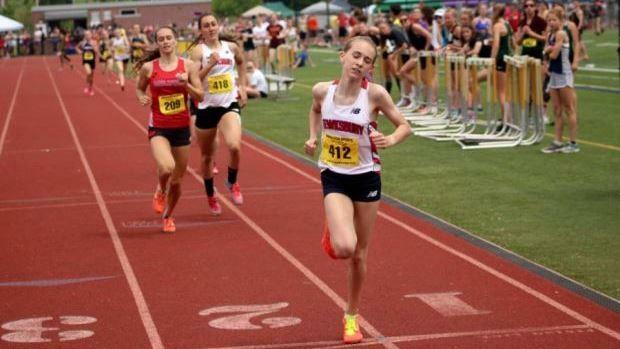 Tewksbury freshman Makayla Paige won the girls' 800m at the EMass Division 3 meet. A well-balanced attack allowed host North Reading to snare the team title at Saturday's Eastern Massachusetts Division 3 State Championships. The Hornets slipped by runner-up Milton, 108.883-103. Tewksbury Memorial was third with 64.66 points. It was Wakefield Memorial that took home the hardware in the boys' competition, defeating second-place Pembroke, 77-53. Tewksbury was third with 51 points. Tewksbury freshman Makayla Paige turned in an impressive performance in the 800-meter run. Paige held off a strong field to win with a time of 2:14.22. Milton's Elise O'Leary was second in 2:15.10. She was followed by Tewksbury's Rachel Sessa, who was timed in 2:15.44 for third. O'Leary dominated the 400m hurdles, winning by nearly three seconds with her time of 1:02.72. She also ran a 57-second leg on her team's victorious 4x400m relay along with teammates Jayda Dillon, Josie Cousineau and Genevieve Connelly. Dillon won both sprint events, taking the 100m dash in 12.34 and the 200m crown at 25.03. In the 4x400m relay, she blitzed a sub 57-second leg. Tewksbury's foursome of Sessa, Paige, Holly O'Leary and McKenzie Clark established a meet record of 9:35.31 in the 4x800m relay. Dracut's Erin McMeniman also set a MR by winning the javelin with a distance of 140-1. Tiana Bazie of Dennis-Yarmouth won the shot (39-3.25) and the discus (132-11). Wakefield's depth prevailed in its team's victory as the Warriors managed just one victory for the day. The lone win came from Patrick Redmond, who heaved the shot a distance of 52-8.25. Medfield's John Churchill captured the boys' 800m. Churchill forged to the front with about 200 meters remaining and finished with a PR of 1:56.93. Wakefield teammates Matt Greatorex (second, 1:57.76) and Tanner Jellison (third, 1:59.92) were next. Milton's Smith Charles was a double-winner. Charles earned gold in the long jump with a leap of 23 feet, 0.25 inches. He was also first in the high jump with a height of 6-6. Newburyport's Sam Acquaviva took control by the midway point of the two mile and won comfortably with a time of 9:48.18. Rohan Singnvi placed second overall in 9:53.43. In the girls' two mile, it was Norton's Julia Palin that broke the tape with a time of 11:13.66. Lexi Quinn of Foxboro was a distant second in 11:32.74. Wachusett swept both team titles at Saturday's meet, held at Hampshire Regional. The Mountainers defeated Saint John's 94-76 to win the boys' title. The girls won comfortably over Westborough, 111-71. Westborough's Isaiah Powers captured the pole vault with a state-leading height of 15-0. Worcester Tech's Herlin Rijo clocked 1:55.81 in the 800m, which ties for No. 3 in the state. The Bromfield School girls and Ayer-Shirley boys proved victorious in this meet. Bromfield edged South Hadley, 63.50-59, for its crown. The Panthers scored 78 points in their win. Oakmont Regional was second with 50 points. Bromfield's Chloe Alfieri dominated the sprints, winning the 100m dash in 12.22 and the 200m at 24.49, both tops in the state.